Many people today want to transition from their demanding 9-5 job into a business of their own. They’re already living on a budget and wonder what it would take to start a cleaning business for free or with no money as an investment. Yes, you can always get something for nothing, but what is the value of that something? If we’re talking about physical products, the quality may or may not be something you actually want. It may be something that you can put work into, so you’re trading the work for the lack of funds. 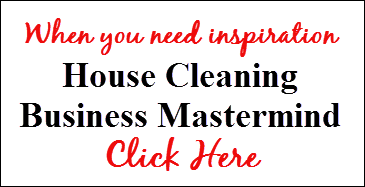 When you’re thinking about starting a cleaning business, this issue is actually a possibility, but again you need to look at the quality of what you are offering and what you will get in return. You can get started using the products and equipment you already have and use in your home, or you can plan on using your client’s. That’s the easy part – now you need to determine how you will get clients. You can start by soliciting your family, friends, and neighbors. You can then use this as a base for testimonials and referrals to build your customer base. This is an industry that has a low entry point, so you can get started for under $100. This number depends on your legal entity, trading work for cash, your products and equipment, and your advertising. Your best chances of getting customers quickly with advertising is to use Craigslist or flyers to canvas neighborhoods. 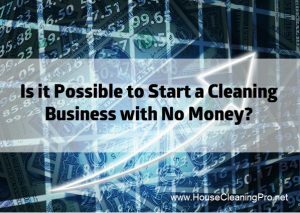 Starting a house cleaning business with no money is certainly a possibility… you just need to be willing to get out there and hustle to get customers. For more information, click here for the blog post I wrote on what you will need to know to service customers and the legal requirements you should consider. You also need to understand the quality of the customers you will be servicing. Consider this: You download a flyer from the Internet that uses low-quality graphics and fonts. The flyer is not impressive, but it is something you can use to canvas your neighborhoods. Who is going to respond to this flyer? What will those people be willing to pay? What is in their mind as they review your flyer? You need to think about this in relation to someone else using a high quality flyer or door hanger. Who would get the call and who would get paid the best in relation to the work that is needed? This is the difference between running a business and trading work for cash. When you run a business, you set the terms. When you trade work for cash, the customer sets the terms. Once you have money coming in to support your efforts, you can always transition into a legal business – just make sure you understand the pitfalls in the meantime.